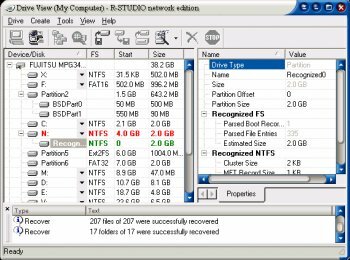 R-Studio is a comprehensive data recovery and undelete program renowned for its ability to recover mission-critical data lost to viruses, malicious attacks, and hardware failures or operating system crashes. It supports FAT/NTFS (Windows), exFAT(WinMobile, Windows Vista and Windows 7), HFS/HFS+ (Mac), UFS1/UFS2 & Ext2FS/3FS file systems and functions on local and network disks, even if partitions are formatted, damaged or deleted. 64-bit Windows versions are supported. Additional file recovery algorithm increases the quality of file recovery and recovers files not recognized in file system metadata. Dynamic disk and RAID (including RAID 6) are supported as well as recovering encrypted files, compressed files and alternative data streams. Files and file systems structures (NTFS/FAT boot sectors, MFT file record, MBR, LDM structures, etc) can be viewed and edited in the professional disk hex editor. In addition to byte to byte copy of any object visible in the Drives panel, smart copy of partitions and hard drives with size and offset adjustment is available. Extended Viewer Plugin allows viewing a content of the found files to estimate recovery chances prior to purchasing. Flexible parameter settings give you absolute control over data recovery. Still the best after all these years. Nothing else comes close when you REALLY need your files, don't waste time, get this and recover whatever you need. No peer for this one app. Still one of the best in class. I am a long years user on Windows XP and Windows 7 Pro. Using regulary on deleted files and partitions or reformated HDs. Can you post a real review instead of throwing baseless accusations? Have you even used this application? I am sure you haven't, so why are you here? Just to counter the no review of some g**, er, guy. This is the finest drive/file recovery tool going. Find a better one if you're gonna rate this one low. Or, didn't you have the cash to buy it? In short, this works when other recovery apps throw in the towel. In fact, I've never had this tool fail to recover files for me. This utility simply works. I tried other recovery programs when my hard drive failed with 80,000+ music files. R-Studio was the only one that recovered them all. This is the best recovery program I have ever used. I have recovered files from damaged disks that programs have even failed to recognise the existence of the disk that the files are on. This application is the best of its kind but remember to always backup important data on a regular basis and in case you haven't followed the aforementioned advice STOP writing anything to your HDDs(logical drives) as soon as you have noticed your data has been lost. One caveat: R-Studio (true as for 2.X version) is unable to restore any files from ext3fs (linux) partitions. This situation might have changed since that time. I havent tried the 3.x versions but I have experience with 2.x versions. Never had a problem with it, it cannot restore EVERY file, but thats how it works. It works most of the times tho, I never had a problem with files I really need to recover :) And another cool thing if you just sitting around doing nothing is to search for deleted files and see what things you deleted 6 month ago or even longer. 5 of 5 for being the best recover-software out there, my opinion.